Someone mentioned the film Midnight Express to me the other day, and my first (ok, second) thought was hmm, wonder how Pandeli is these days? Let me explain. When I first arrived in Istanbul, there were two things I used to hear about with some consistency: the film Midnight Express, and the restaurant Pandeli (not due to any connection between the two, mind you). Interestingly, as the years have passed and the city has gussied itself up a bit, one hears about both of these cultural touchstones less and less. I cannot argue that it is a shame that nowadays visitors are thinking more about what events to attend at the Biennial than “Joey, have you ever been… in a Turkish prison?” But I have to say, after a recent visit to Pandeli, after a decade-long hiatus, that the place deserves a little revival of interest. This is not to say that every single item on the menu is earthshaking. Nor that every item on the menu is priced within the average diner’s budget. But, the menu has not changed in a decade, and the things that I recall as special are still consistently so today. And those things are tasty enough to justify a visit if one happens to be skulking around the Spice Bazaar, especially with out-of-town guests. Because, let’s face it: Eminönü holds quite a treasure-trove of street food but, sometimes, after bumping elbows with its teeming masses, even the most inveterate chowhound might crave a linen tablecloth and a bit of quietude. At Pandeli, as is the case with so many places in Istanbul/the world, you are paying for the ambiance and view. But only to an extent, and as these things go, I for one would rather pony up for Pandeli’s turquoise tiles and 17th-century domed ceilings than fork over my precious lira for a panoramic city view blocked by grazing socialites. But that’s just me. So how do you ensure that all you pay for the ambiance is the two-lira cover? Let’s get to it. Be forewarned: the first page of the menu had me breaking a bit of a sweat. At first blush, this appears to be a listing of appetizers priced between 30 and 60 lira each. And it is just that. But the appetizers are not your average meze. And 30-60 lira per portion for things like caviar and smoked bonito is not utterly outrageous. Just sort of outrageous. 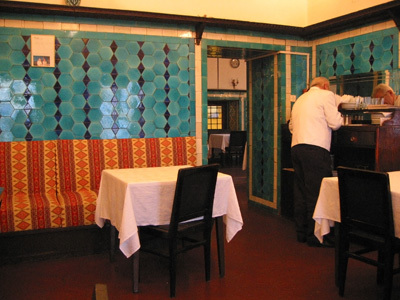 The list does smack of a funny nostalgia, a sort of executive’s lunch circa 1962, but as Pandeli does not offer martinis or champagne, I would skip it (and insist that no unordered plates of anything stay on the table). For small plates, Pandeli offers a variety of vegetables cooked either with olive oil or butter – not something you find everywhere. That said, this is not an esnaf lokantası, not really, and while the veggies may be good, they will not be the most beautiful you have ever eaten. Better to go straight for the eggplant salad, a creamy puree of smoky deliciousness. Having said all that, the dönerli patlıcan börek (henceforth DPB), listed as a small plate, is a) a good solid-sized portion, and b) the single best item on the menu. You know how quiche often comes close to perfect, but is held back by an eggy or over-cheesed heaviness? The DPB at Pandeli delivers on the elusive textural promise of quiche. You have a buttery but not lumpy yufka crust at the bottom, on top of which is a baked layer of that amazing eggplant puree, mixed with a subtle amount of kaşar, the hard melty cheese of Turkey. There is enough kaşar so that the top bakes to crispy perfection, but not so much that the eggplant puree loses its fluffiness. This stuff is darn good, but then, then, they heap on a generous but not gratuitous portion of döner slices. The crispy texture and the meaty flavor of the döner bring the perfect counterbalance to the creaminess of the eggplant börek. And at 10 lira for a portion the size of a Dickens novel, DPB also wins the prize for best deal on the menu. If you are in for a somewhat more substantial meal, there are a few main courses particularly worth noting: the hünkar beğendi (lamb bits over eggplant puree), the kuzu tandır (roasted lamb) and kağıtta levrek (sea bass baked in parchment). None of these are cheap, but they are good. The sea bass dish is the single most famous dish at Pandeli, and it is done in a style one would be hard-pressed to find elsewhere. But at 38 lira, this is where one starts to pay for the “experience.” For my money, the prices on these main dishes indicate a splurge, but I am not convinced that the dishes themselves warrant that splurge. Time to hit a sweet note, no? At Pandeli, you will want to save room for dessert. We went for the sample plate, being the gluttons that we are, and while all the items on the plate were tasty, when I return, I will go straight for the standouts. The kabak tatlısı (stewed pumpkin) is a light, beautifully textured take on a dish I usually find to be a bit too much, like a sugary punch to the solar plexus. Not so at Pandeli, where it has a great texture and a balanced sweetness that allows the pumpkin to flaunt its flavorful self. Pandeli’s sweet specialty is an almond cookie, a bademli kurabiye of the crumbly variety. The spicing is a light touch, and the ground almonds in the cookie are crunchy-licious, great with after-lunch tea or Turkish coffee. The third standout is the kazandibi, and here I am about to get myself into trouble. 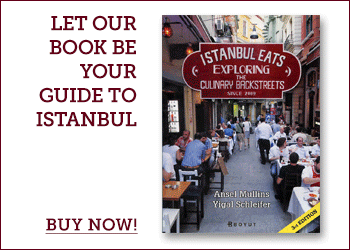 Let me just say, reading Istanbul Eats was a big part of how I learned to stop worrying and love the Turkish chicken-breast pudding. Now one might even call me a pudding snob (I’m looking at you, Saray). So before whipping yourselves into a frenzy of clucking rage, take a deep breath and hear me out when I say I really like the kazandibi at Pandeli. I fully acknowledge that it is not chewy. It does not fight the spoon. In fact, it is more of a crème brulee texture, a bit custardy. But it is the real deal, the chicken breast was in there. Proof’s in the pudding, so to speak. And, when I head back to Pandeli, I’ll be calling dibs on the kazandibi. Pandeli is a lovely space (worth reserving a table in the rooms facing outside onto the square), the service is old-school and nonintrusive, and offers a quiet refuge from the madding crowds below. In the wild and woolly world of “touristed” restaurants in Istanbul, there is much to be said for consistency, and Pandeli seems to have that down pat, judging by my experiences, decades apart. The place does deserve a visit, both for its pleasantly anachronistic vibe, and its time-tested tastes. 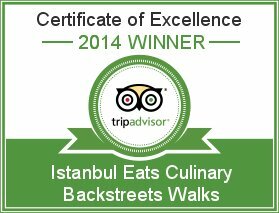 I will definitely head back soon, most likely dragging a gaggle of guests shell-shocked by the Eminönü backstreets, for a lunch of their dönerli patlıcan börek, followed by a little sweetness with my coffee. No more, no less. The 2 TL cover thus ends up being very little money, very well spent. The More You Know… Pandeli is a lunch spot, though they get the busiest around 2 p.m. It is worth making a reservation for a table in the front rooms, though not necessary. To reach the restaurant, one must climb a somewhat daunting staircase. Alcohol is served, but expensive, and the selection is not particularly exciting. I love you guys, you know it, but I have to take issue with a review of this restaurant, and your review a few months back of Hamdi. 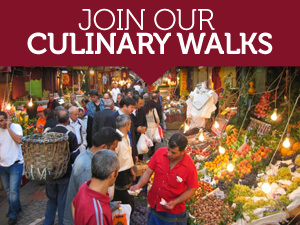 Both these places are the antithesis of good eating in Istanbul: affordable, tasty and reflective of the local culture. Any place, like this and like Hamdi, where diners constantly have to be on the alert for dishes they don’t ask for being placed on the table, overpriced mediocre food (30 TL for an appetizer in Turkey is ridiculous) and — I apologize if I read this incorrectly — a cover charge (??) is firmly on the tourist trail and doesn’t deserve space on the delightful IE. I think you do a disservice to visitors to Istanbul by calling these places anything but what they are: egregious tourist traps. But I say that with love. Thanks for the note and we understand where you are coming from. Still, like death and taxes, for some visitors to Istanbul, Pandeli (and other iconic spots, such as Hamdi), might be unavoidable. The idea with these specific reviews — which we are now running with the title “If You Insist…” — is to take a cold hard look at these immovable objects and offer up some advice and ordering strategies for those who, like a moth to the light, are drawn to these places. As with most places, there are some gems on the menu, and some not-particularly-good-bargains. With Pandeli, whenever I have a hankering for the buttered spinach or their “patlican salatasi” (“eggplant salad” doesn’t do the dish justice! ), I am never disappointed; in fact, I find myself briefly transported to some otherworldly state of bliss. Pandelli was the worst restaurant I ate at in a 12 day tour through Greece and Turkey!! Also a rip off!!! Deserves a zero star. We ordered a salad that came swimming in water for 10 liras. The bread was stale (2 liras worth). I asked for lemon and olive oil. They brought in 2 dried up pieces of lemon and a dirty olive oil glass decanter with a sediment in it that was difficult to identify. The eggplant salad for 10 liras was ok but have had better ones. I also ordered what was listed as an eggplant and doner borek. What arrived was a piece of potato souffle. The Kofta kebap was ok but at 22 liras way overpriced. Service was terrible when the restaurant was empty. We had to ask for service since the waiters did not show up to check on us. The final check was 89 liras after they added a 10% service charge. The 2 beers we ordered at 10 liras each were probably the best part of the meal. In summary, I agree with ‘carpetblogger’ above. Pandelli is an overpriced tourist trap that most definitely should be avoided while in Istanbul. Thanks for the note. Sadly, sounds like you had the classic Pandeli experience!